I miss my suits. The feel of dry-cleaned fabric tailored just so. The sound of my heels clicking against the floor as I navigated my way around cubicles and edit bays. 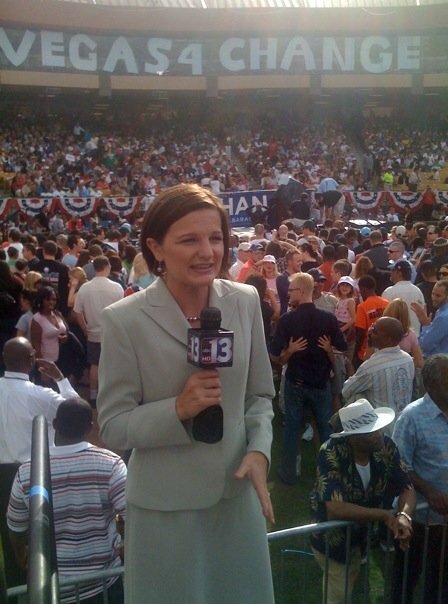 This is a power suit color only to be worn on TV and never past the 2008 election. As a little girl I never wanted the princess costume - I wanted the power suit. To be like the women with thick costume jewelry, gold watches and manicured hands carrying leather briefcases and designer bags, all bought with their own paychecks. I’ll never forget my first one. It was black. My aunt was there and encouraged me forward as I dropped $159 on a simple skirt and jacket from The Limited clothing store. A few months later, I bought a tan one with pants and jacket. I had baby blue and pale pink long sleeve button downs that matched perfectly with either one. Over the years I budgeted carefully for select power pieces, updating with each new raise and job. I knew I had made it when my station in Vegas offered me $1,000 a year for hair, clothes, and makeup. Power suits were hung next to power dresses, power boots, and half a dozen power coats, including a navy blue beauty from Banana Republic. Before leaving Las Vegas I took more than a dozen of those suits to Goodwill. I no longer needed them. My days are now a mix of comfortable cotton, flip-flops, and maybe a tinted moisturizer if I have to leave the house. I haven’t seen the dry-cleaners in almost two years. Then last night I was in Target. TARGET of all places! I perused through the women’s racks and was hit with a desire to dress up in the nearest Merona and Mossimo dress so hard that I immediately wanted to go apply for a job as a bank teller, or office assistant - just so I could feel that power outfit one more time. Don’t get me wrong, I know it was right to leave my news career. I love writing. I feel so blessed to have been able to write a book free from the demands of a 40 hour work week. So why am I longing for career wear? Maybe it’s just that I grew up poor, and a power suit means a paycheck and a paycheck meant freedom. Maybe it’s that the power suit means I’m powerful, and I have the deluded idea that feeling powerful means I’m important. And even more deluded, if I’m important...I matter more. Maybe it's that even though I love my new life of writing, until I get published, I'm self-conscious that people think I found a new hobby and not a new career. Or maybe I just look my best in a pair of Elie Tahari pumps. 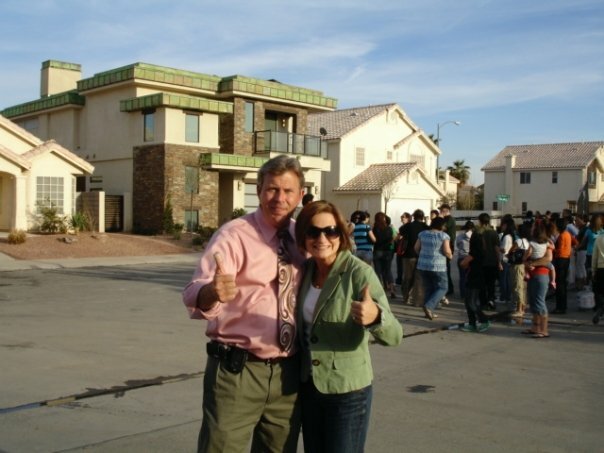 During our Extreme Makeover Home Edition coverage in Vegas. I'd had this jacket since my first job in Guntersville. A Target special and probably my favorite. I'm upset I put it in the Goodwill pile and suffer from severe donator's remorse.